NEW! Try our secure EndNote webstore for immediate delivery of your license! More than just a reference manager. EndNote moves you through the research process as you search, organize, write, publish and share. 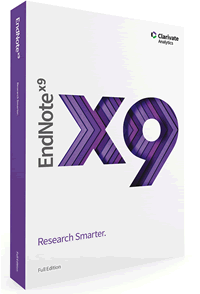 Leave behind the tedious work of bibliographies and reference management and take your research to the next level with the new EndNote X9! New! Library sharing – Work on the same EndNote library, at the same time, with up to 100 other collaborators. Which EndNote is right for you? The most powerful research and reference manager on the market. All the capabilities you see on this page, on your desktop and online. The perfect sidekick to EndNote desktop and online. Now your EndNote reference library weighs less than 2 pounds. Completely free, online-only access to our basic reference manager – perfect for writing that first research paper.